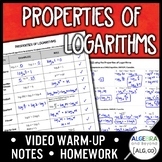 Cornell Notes Template for beginning the properties of logarithms. 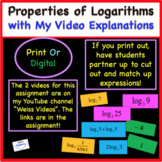 This template shows the connection between the law of exponents and properties of logarithms. Expanding and Condensing is also presented together to show the connection between them as it relates to each property. 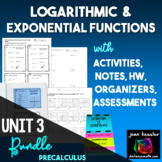 Students are required to solve exponential equations, convert from logarithmic to exponential form and from exponential to logarithmic form, and apply logarithmic properties. 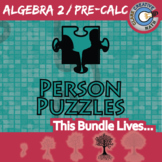 These sheets are design to introduce the basic concepts behind the Properties of Logarithms. 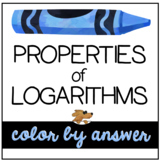 Properties of Logarithms. 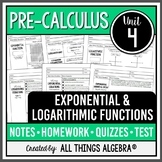 Questions and solutions related to properties of logarithms. Student handout covering properties of logarithms. 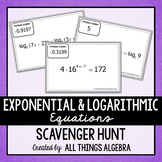 Exponential and Logarithmic Equations Scavenger Hunt This scavenger hunt activity consists of 16 problems in which students practice solving exponential and logarithmic equations. 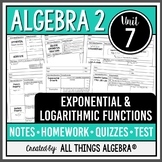 The equations require knowledge of the logarithmic properties and the use of logarithms and exponentials as inverses. 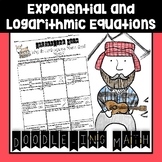 Logarithms and Their Properties "Explore, Cut, & Match"